AIR FRYERS ARE LIFE SAVERS! The Air-fryer is my life! Why is salmon so amazing? For instance, it is incredibly nutritious with Omega-3 fatty acids, it cooks super quickly, and it’s incredibly yummy! Besides, that, when it comes to meal-prep, salmon is my number one choice because it only takes 8 minutes in the Air-Fryer and its cooked perfectly EVERY time. 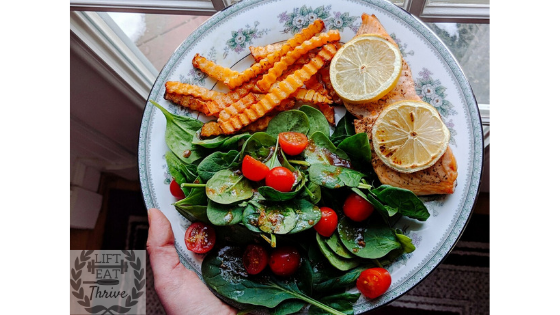 Throw a side salad and some air fried sweet potato fries or butternut squash and you’ve got a perfect, quick and easy post workout meal For those of you on either the Whole 30 or Paleo Diet, definitely try this recipe out. Are you looking for quick and yummy ways to cook your veggies with no mess? Say no more, YOU. NEED. AN. AIR. FRYER. I use mine EVERY day, and it has been a life saver! When I am low on time, I throw some carrots in the bucket, drizzle some oil, set the time, and let the magic begin. It takes literally 30 seconds for me to dump in my ingredients. While it cooks, I either take a shower, or cook the meat! Above all, once I discovered how to cook salmon in it, I now make it 3-4 times per week. It takes 8 minutes to cook…….8 MINUTES!!! The Air Fryer also allows me to make healthy crispy chips, fries, chicken wings, roasted veggies, and even bake sweets! For those looking to keep our macronutrients in line, it allows you to fry foods without soaking them in a bucket of hot oil. Now you can hit your wellness goals and still enjoy “fried” foods! Are you in need of recipes inspiration? Go follow us on instagram @Lift.Eat.Thrive! I was able to snag this one on sale for about $60+shipping. If you check the website every so often, they will have great sales on their air fryers! Most importantly, enjoy this beautiful Salmon Plate Recipe! Dijon mustard to taste- I used 1 tsp on my salad. 1 serving crinkle cut butternut squash fries (from Whole Foods). If you don’t have access to Whole Foods, you could easily slice up your own butternut squash as well with a knife or mandolin slicer! First, throw the sqaush in Air Fryer and toss in olive oil. Next, Air Fry at 370 degrees for about 5 minutes (until edges are slightly browned). What if you don’t have an Air Fryer? Likewise, you can easily toss 1 serving in the oven at 400 degrees for 5-10 minutes. Don’t have an Air Fryer? Similarly, toss in the oven at 400 degrees for 8-15 minutes. As always, thanks for reading. When you have the time, head on over to our page and give us feedback on recipes! We are open to suggestions and requests as well!